The Great Synagogue is located on Elizabeth Street, and stretches back to Castlereagh Street. This heritage listed building, designed by architect Thomas Rowe, was consecrated in 1878. 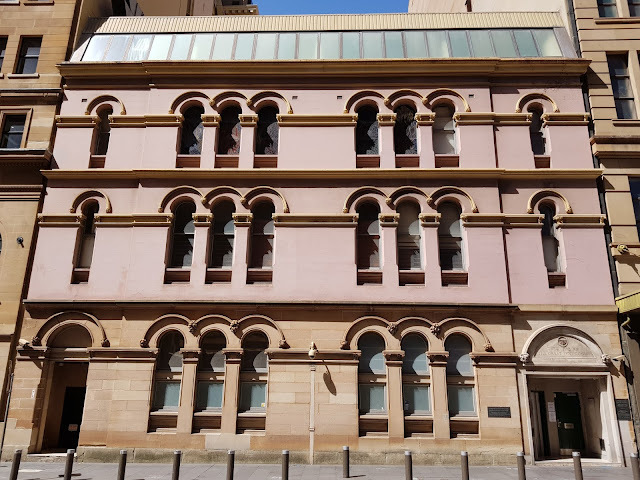 The Great Synagogue consists of two main sections: the original synagogue, the house of worship with ladies’ gallery at the Elizabeth Street end, and this five storey modern section at the Castlereagh Street end behind the facade of the original Beadle’s residence. Linked to: Shadow Shot Sunday, Sundays In My City, InSPIREd Sunday. That's an impressive structure, Jim. Thanks for linking to Shadow Shot Sunday 2! Awesome synagogue ~ and great photo! I'm glad that's a heritage listed building, good to keep it, so many old buildings are being pulled down. ...from the street I wouldn't know what kind of building it is. A synagogue was founded in York St in 1844 and another in Macquarie St, so I am very pleased that the two communities got together in 1878 to form one, very large and beautiful facility. I love taking pictures of windows. I wouldn't have guessed it was a synagogue either. I've been to a few Shabbat services there. The security there is very serious. Guess I never knew there was that back side to the synagogue, so thanks for your photo today. But I hope readers will follow your link and also see the FRONT door and beautiful rose window.